Outspoken Bean, listed as the 2013 9th Wonder in the Individual Word Poetry Slam Competition, presents San Antonio’s 2nd Annual Poetry Slam where young gifted poets of the spoken word compete to become known as the best of the best. Young men and women from all across South Texas will be bringing their best talents for the spoken word. Come see and hear the generation that has put away their gadgets to use their words and their emotional IQ’s to tantalize, scandalize, and educate! Tickets can be purchased for $20 at Eventbrite.com. 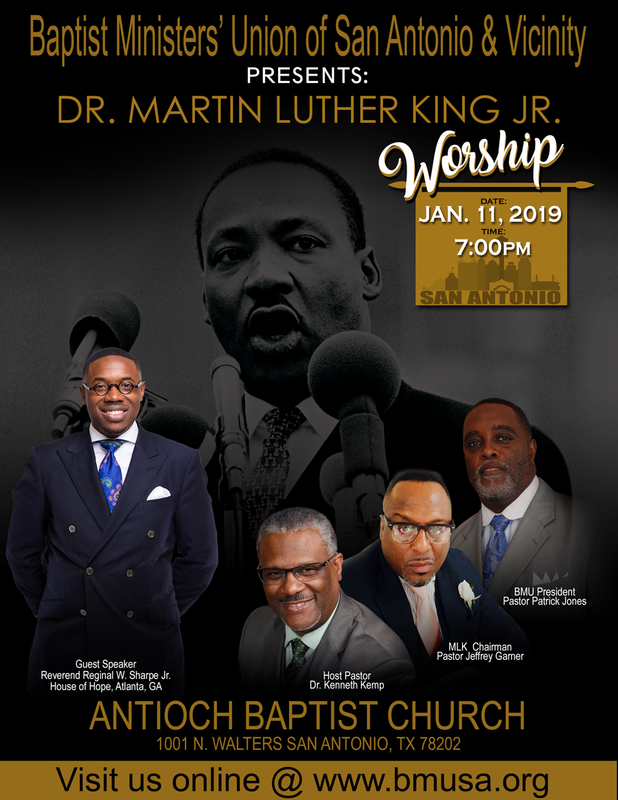 Our friends at BMU of San Antonio & Vicinity will be kicking off the 2019 MLK events with an evening of worship featuring guest speaker, Reverend Reginald W. Sharpe Jr. of House of Hope, Atlanta, GA.
SANCSC, as a partner of San Antonio Martin Luther King Jr. Commission, invites the community to the 24th Annual Martin Luther King, Jr., Birthday Celebration honoring the life, struggles and accomplishments of Dr. King. Donation is $40 for a full course meal, keynote speaker, entertainment and a dance. Dress is semi-formal/formal. The event will feature a prominent guest speaker: Mr. Nevil Shed, Motivational Speaker, of San Antonio, Texas. Tickets must be purchased five days before the event. No tickets will be sold at the door. Contact Mr. Alexander Harris, 210.364.9066 for tickets and base access. The San Antonio Martin Luther King, Jr. Commission invites the community to the Commission's annual Wreath-Laying Ceremony honoring the life, struggles and accomplishments of Dr. King. Businesses, City Officials, and organizations will lay wreaths at the MLK, Jr. statue in commemoration. Keynote Speaker: Dr. Colette Pierce Burnette, the first female President and Chief Executive Officer of the historic Huston-Tillotson University, Austin’s oldest institution of higher learning and only historically black college and university. Free and open to the public. The Annual Citywide Interfaith Worship Service, presented by the San Antonio Martin Luther King, Jr. Commission, will feature several invited guest speakers who will present on various topics of faith and the legacy of Dr. King. Free and open to the public. Keynote speaker: Dr. Mateen Diop, educator, author, publisher, activist, and current principal of Sam Houston High School. The community is invited to enjoy a positive and uplifting experience during the Early Morning Worship Program. 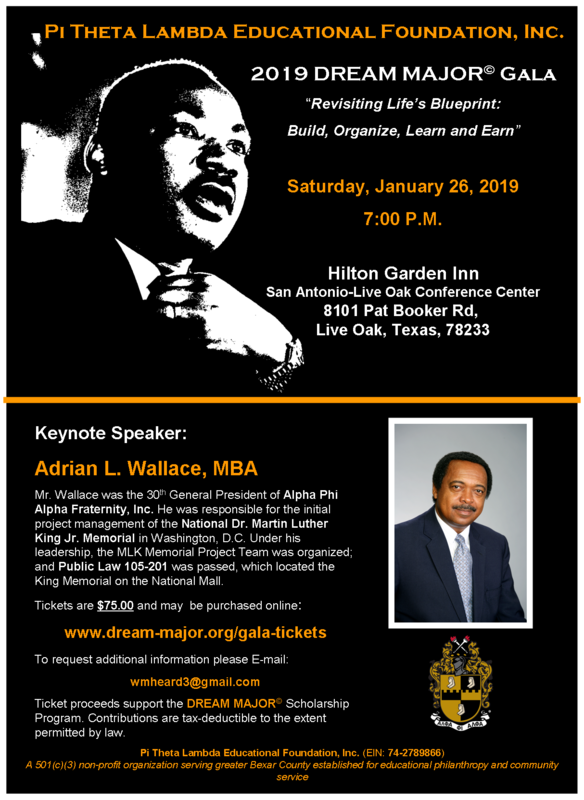 Presented by the San Antonio Martin Luther King, Jr. Commission, the event features contemporary and traditional musical artists, inspirational and motivational dances and spoken word performances. Free and open to the public. This event will include Food Bank donation bins. Please bring nonperishable food products to donate. The annual march, organized and presented by the San Antonio MLK Jr. Commission and the City of San Antonio, begins at the MLK, Jr. Academy and ends at Pittman-Sullivan Park, 1101 Iowa. The nearly 3-mile route down Martin Luther King Drive takes participants through San Antonio's historic Eastside in remembrance of Dr. King. In 2018, approximately 300,000 people participated in the march as part of an unforgettable experience that has become one of San Antonio's signature events. Free and open to the public. For route information or VIA Park & Ride details, visit sanantonio.gov/mlk. The San Antonio Martin Luther King, Jr. Commission's Commemorative program is one of the highlights of the annual commemoration honoring Dr. King. The program will feature the City of San Antonio Mayor Ron Nirenberg and other national, state, and county officials. The presentation of the Baha'i Unity of Humanity Award and the Rev. R.A. Callies Courage Award are also part of the program's highlights. Free and open to the public. Keynote Speaker: Shaun King, journalist, humanitarian, and activist. 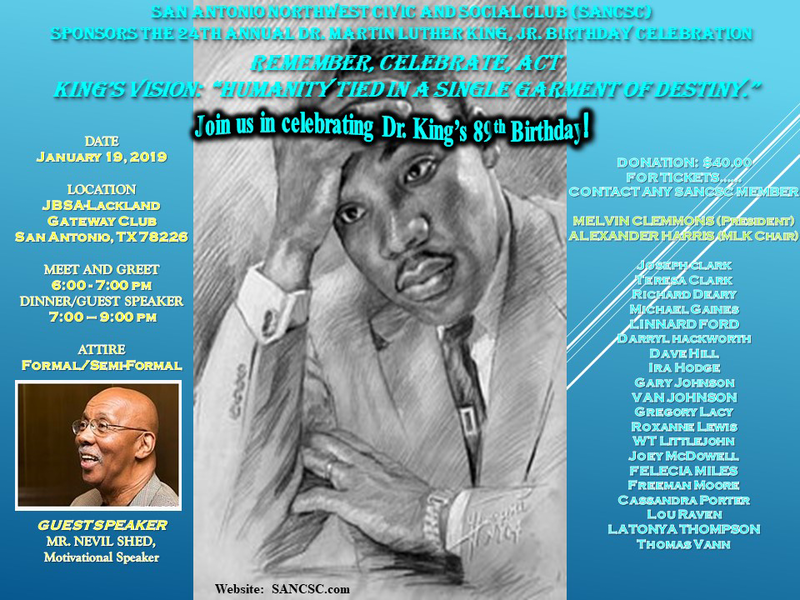 King is nationally recognized as a humane and passionate advocate for justice and families, and an extremely visible fundraiser for victims of brutality and discrimination. Free and open to the public. Trinity University will honor the late Dr. Martin Luther King, Jr. with a public lecture and participation in the San Antonio march commemorating the civil rights leader. Trinity is proud to present Seattle-based writer, speaker, and Internet Yeller, Ijeoma Oluo as the 2019 keynote speaker. Oluo will be signing copies of her renowned debut book, So You Want to Talk About Race. In this New York Times bestseller, Oluo explores the complex reality of today's racial landscape--from white privilege and police brutality to systemic discrimination and the Black Lives Matter movement--offering straightforward clarity that readers need to contribute to the dismantling of the racial divide. This event is free and open to the public with first come, first served seating. Event Contact: Odis R. Blueitt 210.792.4146 for ticket and event info. General admission (includes light refreshments) is 6$ for adults/ 3$ for Children/students & Military. Meal Admission (includes 1 meat, 2 sides, 1 bread, beverage and dessert) is 11$ for Adults and 7$ for Children/Students & Military. For RSVPs and more information, contact Alexandria Garcia at agarcia285@mail.stmarytx.edu or 210.445.2077. MLK Full Commission Meetings take place on the second Monday of every month. APPLICATION DEADLINE: Friday, February 22, 2019 at 4 p.m. Incomplete applications will be disqualified. For more information visit: MLK Scholarship.